Do you count it as a loss, an expensive lesson, sell and move on? ; Or just freeze like a rabbit caught in the spotlight, holding what you have, hoping for a price recovery one day? We face this dilemma now. Silver Chef (SIV.AU), a stock we own, fell over 40% from its high of $12.16 a share on 11 October 2016 to a low of $7.04 on 6 March 2017. The Company then announced a $21m equity raise at $7.00 per share. In a sense this blog is a case study of how our process deals with unexpected events. First question: how did we get here? The long answer is covered very well in a blog site called “Find The Moat". Silver Chef has diversified away from its core hospitality equipment leasing business where it has a competitive advantage and a long history of extremely profitable growth. This is the bad news. It culminated in a 55% decline in net profit for Silver Chef in the half year ended 31 December 2016, with the majority of negative earnings change coming from GoGetta’s bad debt and asset impairment expenses. The real driver of higher credit costs within GoGetta is the light commercial vehicle segment, which despite being 31% of GoGetta rental assets at 31 December 2016, caused over 50% of GoGetta’s payment arrears. Given we know GoGetta experienced a 7.6% bad debt to revenue rate, we can easily back out the implied level of bad debts per dollar of revenue for Light Commercial vs the residual GoGetta book. We want to do this to see if it’s a relatively easy fix or not. The $100 asset value is just a notional number to allow us to do the easy math and we are assuming revenue yield correlates to asset size. Straight away you can see that the problem child driving bad debts is light commercial. Cut this, and the level of bad debts must fall all else being equal; ergo earnings must rise. Second question: where to from here? Management confirmed to us that the light commercial division is now only ~15% of new leases in GoGetta. Even if management did nothing else, given light commercial has halved, we’d expect bad debts from that segment to also halve. Second, management are adamant that the causes of GoGetta’s problems are being addressed. It becomes apparent these new measures are working when you look at the seasoning chart shown on page 15 of a recent investor presentation. The seasoning period in GoGetta, i.e. the time taken to see how many customers are going to experience payment difficulties, is around 6 months. The December 2016 vintage of GoGetta originations, now ~3 months old, has an arrears rate of ~2%; if we double this to factor in a 6 month seasoning period, we can see that the ~4% run rate of arrears is a significant improvement vs 7.6% in the last financial period. Finally, Silver Chef state the average GoGetta lease life or “tenor” is around 2 years. This is really important information. It means the average rental asset rolls off after 2 years. 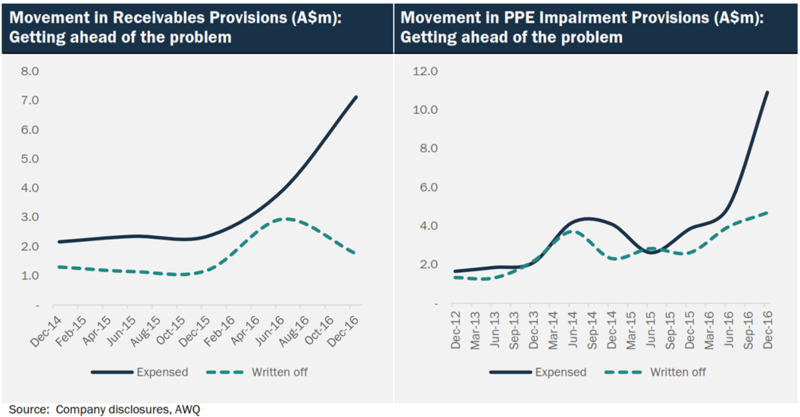 So, if management have fixed their adverse selection issues which seems to be the case, formation of new credit costs will recede quite quickly; meaning underlying earnings will rebound quickly too. We can quantify this. We know after October 2016 the GoGetta underwriting standards tightened materially leading to materially lower payment arrears. If we take GoGetta’s asset additions every half year and apply a constant rate of decay that matches to a 2 year average contract life, we can calculate what approximate percentage of the GoGetta rental asset book was originated after October 2016. 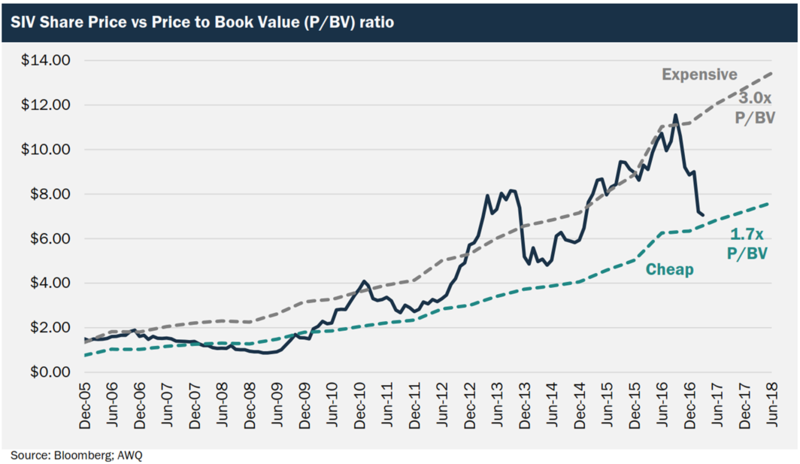 As the book mix tilts towards recent origination, the credit quality should improve, leading to lower credit charges and better earnings. As you can see, by 30 June 2017, over 50% of the GoGetta rental assets will have been originated after October 2016 and so will pose less earnings risk. It is also important to understand how the accounting for GoGetta’s credit issues has played out and what this portends for future earnings. In the last half year result, the Company took very large charges to buffer GoGetta’s receivables and rental equipment carrying value. These charges to the P&L were far in excess of credit cost experience in the half, as the charts below show. Simply, the P&L took a big hit in a single period. And provisions for rental equipment impairment and receivables, used to absorb future influx of credit costs, increased dramatically. Hence we think management guidance of an earnings rebound in the second half of fiscal 2017 is highly credible, given the fact that the “good book” of GoGetta, originated after October 2016, will be increasing rapidly as a proportion of rental equipment. Our earnings forecasts are below. Note that 2017 net income forecast of $22m is simply the mid-point of management statutory net profit guidance. Silver Chef’s earnings are like a garden hose someone has crimped. Profit flow was diverted in the first half of fiscal 2017 to build provisions in the balance sheet to deal with GoGetta credit issues. We know the problems should recede given the shrinking proportion of pre October 2016 GoGetta rental assets, much lower levels of light commercial originations and improved underwriting processes. So, earnings are highly likely to bounce – hard – in the second half of the financial year to June 2017. On this basis it is not hard to see that Silver Chef is probably trading at around a ~7x forecast 2018 P/E - arguably very cheap, with significant upside. We sold 35% of our total position size in November at $10.85 as valuation became stretched. Despite the fall, given the contribution from dividends and a well-timed sale, we are still in the black on this one. If you are interested in receiving updates from the Arowana AVOF team, please visit our website. While all reasonable care has been taken in the preparation of this article, neither Arowana Australian Value Opportunities Fund Limited (“Fund”) nor AAVOF Management Pty Ltd (“Fund Manager”) is responsible for any errors nor misstatements. To the full extent permitted by law, no representation or warranty is made, and any and all liability is disclaimed, in relation to the accuracy or completeness of any statement, opinion, forecast or information contained in this presentation. The information provided within the article is not intended to be a complete description of matters described. This article has been prepared for the purposes of providing general information only and does not constitute an offer, solicitation or recommendation with respect to the purchase or sale of any securities in the Fund nor does it constitute financial product or investment advice nor take into account your investment objectives, taxation situation, financial situation or needs. An investor must not act on the basis of any matter contained in this article in making an investment decision but must make its own assessment of the Fund, conduct its own investigations and analysis, and seek independent financial, taxation and legal advice. Past performance is not a reliable indicator of future performance. Usage of and linking to this article is at the user’s own risk. Neither the Fund Manager nor the Fund is liable for any loss or damage to a user’s system or to people linking to this presentation from a third party’s website or email. Any such loss or damage is at the responsibility of the user. SIV has wiped out shareholder value on three separate occasions in the last year. As the saying goes, "fool me once shame on you, fool me twice shame on me" - but three times? Perhaps the problem is not so much the business as the management, and its only a matter of time before the next cockroach in the kitchen pops up.